Wednesday | January 11, 2017	11 days into the brand new year of 2017, Bakerzin’s Original Pineapple Tarts has won a few streaks of accolades. Bakerzin’s famed Original Pineapple Tarts won The Sunday Times Top 3 Yummiest Pineapple Tarts and 6 Best Pineapple Tarts in Singapore by Silverkris, inflight magazine of Singapore Air, in 2015 and 2016 respectively. This year, no accolades go unnoticed when our master chefs are hard at work, bringing in premium butter, fine tuning our signature pineapple jam to showcase the very best to our customers and media. The Honeycombers Singapore recently highlighted our range of Pineapple Tarts were awarded an A+ for creativity and presentation. To headline the title of Best Pineapple Tarts in Singapore among the many tough competition, this definitely means more than words. Yahoo Singapore credited our Original Pineapple Tarts for 'its auspicious ingot shape, with crumbly pastry giving way to homemade pineapple jam with each mouthful – truly one of our favourites every year.’ 10 Most Addictive Chinese New Year Snacks of 2017 awarded to Bakerzin’s Original Pineapple Tarts is a perfect title! 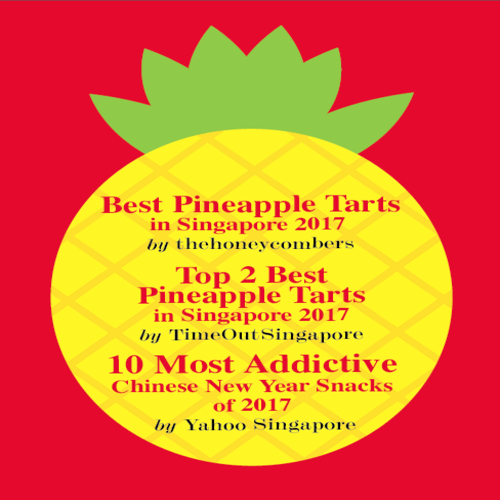 TimeOut Singapore did a blind test amongst 5 brands and Bakerzin’s Original Pineapple Tarts beat out 3 brands and won the Top 2 Best Pineapple Tarts this year! ‘They achieved the right pastry-to-filling ratio. The pineapple jam is cooked with cinnamon and cloves, adding dimension to each bite.’ In addition to the 8 Bakerzin outlets retailing our famed Pineapple Tarts, we have an additional 4 booths this year, Chinatown Point and Jurong Point which are in operations and the upcoming Ang Mo Kio Hub and Northpoint booths opening from 16th January 2016 onwards. Hurry down and grab a piece of our ingot shaped Original Pineapple Tarts now!